The Central Railroad of New Jersey, also known as the Jersey Central or Jersey Central Lines (reporting mark CNJ), was a Class I railroad with origins in the 1830s. It filed for bankruptcy three times; in 1939, 1947 and on March 22, 1967, the CNJ filed for bankruptcy for the final time. It foreshadowed the rest of New Jersey's railroads, but not by much. It then pulled out of Pennsylvania completely in 1972. While most of the passenger services, structures and equipment were picked up by the State of New Jersey, later NJ Transit, it was absorbed into Conrail in April 1976 along with several other prominent bankrupt railroads of the northeastern United States. Only two of the railroad's steam locomotives were preserved: CNJ No. 592 & CNJ No. 113; the latter is the only one that is still operational. The CNJ's main line had a major presence in New Jersey. Most of the main line is now used by the Raritan Valley Line passenger service and trackage from the CNJ main line in Phillipsburg, New Jersey became part of the Lehigh Line under Conrail; the Lehigh Line is officially the former main line of the Lehigh Valley Railroad. The Elizabethtown and Somerville Railroad was chartered on February 9, 1831, to build from Elizabeth on the Newark Bay (with a steamboat transfer to New York City) west to Somerville. The line to Plainfield was completed in March 1839, connecting to the New Jersey Rail Road in Elizabeth. Extensions took it west to Dunellen in 1840, just east of Bound Brook in 1841 and to Somerville in 1842. The Somerville and Easton Railroad was chartered on February 26, 1847, to continue the line west to Easton, Pennsylvania. The first extension, to Whitehouse, opened in 1848 and was leased to the Elizabethtown and Somerville Railroad. On February 11, 1849, the Elizabethtown and Somerville Railroad bought the Somerville and Easton Railroad, and on February 26 the two companies were consolidated as the Central Railroad of New Jersey. The rest of the line to Phillipsburg opened in 1852, and on September 8, 1855, the upper level of the Lehigh Valley Railroad's Easton Bridge over the Delaware River, extended the CNJ to Easton. At that time, Lehigh Valley coal trains began running over the CNJ to Elizabeth. A similar operation with the Delaware, Lackawanna and Western Railroad, joining at Hampton, began May 27, 1856. This required the addition of a third rail as the DL&W was 6 ft (1,829 mm) broad gauge. 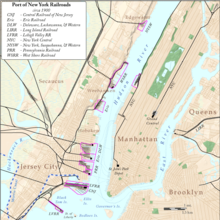 On December 1, 1859, the CNJ arranged to run over the New Jersey Rail Road to the latter's terminal in Jersey City. That operation began December 19, and included a third rail for DL&W trains. The South Branch Railroad, controlled by the CNJ, opened July 1, 1864, as a branch from Somerville to Flemington. The CNJ's extension to its new terminal in Jersey City, including the first CRRNJ Newark Bay Bridge, opened on July 29, 1864, with a ferry transfer to Cortlandt Street in New York City, ending operations over the NJRR. On July 23, 1869, the Newark and New York Railroad opened, providing a straight route from downtown Newark to the CNJ's Jersey City terminal. The Newark Branch, running north from Elizabethport to the N&NY in Newark, opened June 7, 1872. On October 6, 1873, the CNJ leased the New York and Long Branch Railroad, which was in the process of building from Perth Amboy southeast to Long Branch. At the same time the Perth Amboy and Elizabethport Railroad was building from Elizabethport on the CNJ south to Perth Amboy. Hostilities at the crossing of the Pennsylvania Railroad's Perth Amboy and Woodbridge Railroad in April 1872 led to an injunction against the PRR interfering with the construction. The CNJ bought the PA&E later that year. The full line to Long Branch opened September 7, 1875, and was later extended south, reaching Bay Head in 1881 by acquiring other companies. In 1882 the CNJ and Pennsylvania Railroad agreed to use the line jointly, with trackage rights granted to the PRR over the Perth Amboy and Elizabethport between the Perth Amboy and Woodbridge crossing and its south end at the Raritan River bridge. The CNJ leased the Dover and Rockaway Railroad for 990 years from April 26, 1881; the Ogden Mine Railroad for 999 years from January 1, 1882; and the Hibernia Mine Railroad for 20 years from October 1, 1890, renewed at least once for another 20 years. In 1901 the Reading Railroad gained control of the CNJ, which lasted until the creation of Conrail on April 1, 1976. The first commercially successful diesel-electric locomotive, manufactured by Alco in 1924, was built for the Central Railroad of New Jersey. In 1929 the CNJ began operating its most famous train, the Blue Comet, from Jersey City to Atlantic City. It ran until 1941. The Interstate Commerce Commission (ICC) authorized the CNJ to acquire the Wharton and Northern Railroad and the Mount Hope Mineral Railroad on February 4, 1930. The Hibernia Mine Railroad was merged into the CNJ on November 25, 1930. CNJ had its northeastern terminus at Elizabethport, New Jersey. In 1864 CNJ extended its railroad across the bay into Bayonne, and north to the Jersey City terminus. It had used a succession of bridges over the years, the last being Newark Bay Bridge, demolished in the 1980s. From Elizabethport, trains went to different corridors. One headed towards Elizabeth and Plainfield and points west and southwest. The second went south towards Perth Amboy and today's North Jersey Coast Line and different southern New Jersey destinations. CNJ operated several trains into Pennsylvania and other points west or south, in association with the Reading Railroad. B&O also used CNJ tracks for the final approach to Jersey City. As a part of Norfolk Southern's 30th anniversary in 2012, the company painted 20 new locomotives into predecessor schemes. NS #1071, an EMD SD70ACe locomotive, was painted into the Central Railroad of New Jersey tangerine and blue. The Delaware-Lackawanna Railroad in Scranton, Pennsylvania restored a CNJ RS-3 locomotive, numbered 1554. It is currently in regular freight service as of 2018. ^ "Opening of the Newark and New-York Railroads". The New York Times. July 24, 1869. p. 8. Retrieved 2011-11-19. ^ Alecknavage II, Albert (July 6, 2003). "Philly NRHS - Reading Company History". Retrieved 2009-12-06. ^ "The Central Railroad of New Jersey". www.jcrhs.org. ^ "The Central Railroad of New Jersey". Wikimedia Commons has media related to Central Railroad of New Jersey. "Railway Consolidation". The New York Times. March 19, 1872. p. 5. "New-York and Suburban News". The New York Times. June 1, 1872. p. 8.